I’ve missed a lot in SL the last several months, but I’m baaaaaaack! 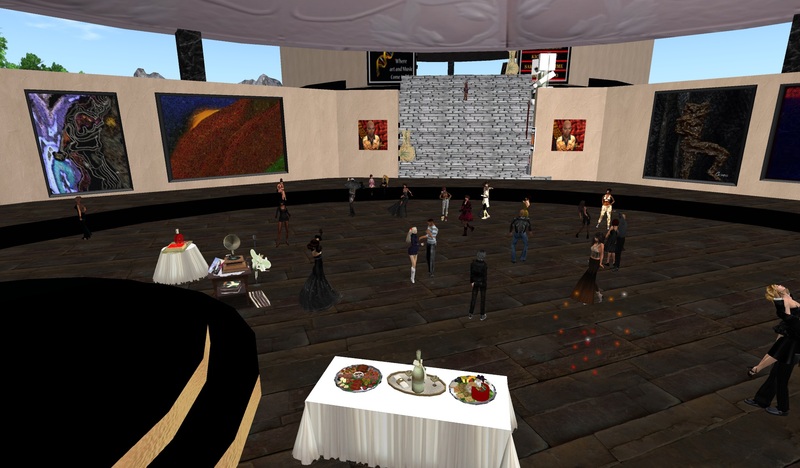 I hate missing parties and I missed the Victorian Vernissage in Caledon back in November. 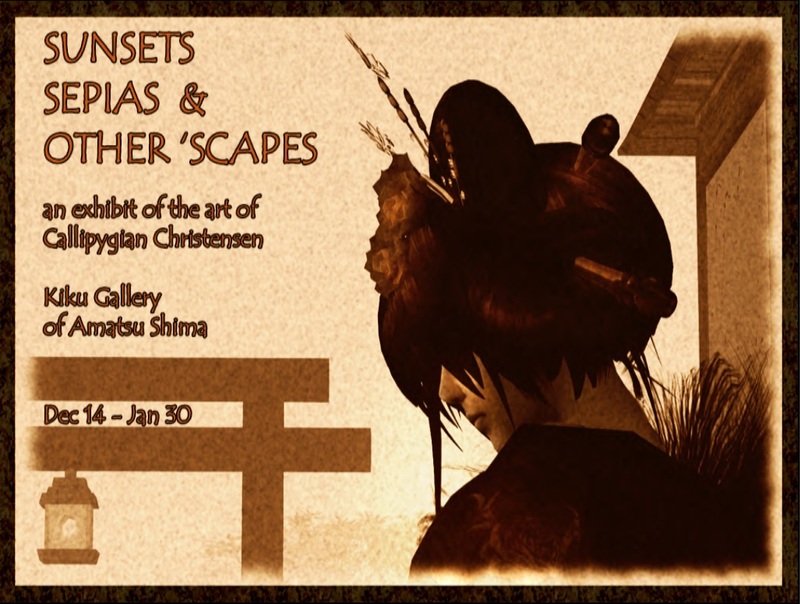 The vernissage was for Callipygian Christensen’s newest art exhibit: Sunsets Sepias & Other ‘Scapes. Honour was fortunate enough to be there, in proper Victorian dress. I knew I would probably miss the vernissage so Calli invited me over to watch her as she hung the pictures. These photos were all new to me. This exhibit is a collection of images of the Great Wall and the countryside around it. Calli has been experimenting with sepia tones and the results are lovely. Although the exhibit started back on December 14th, it will be on display until January 30, 2011 at the Kiku Gallery of Amatsu Shima. When I went to visit, the sim had already gone into winter-mode. It is a beautiful sim. I played about with the windlight settings, trying to practice. It takes me awhile, but ultimately I’ll grasp some of the essentials of lighting. I enjoyed the gallery also. Often I end up in places where I need to figure out how to get from one altitude to another. Yeah, these things are still difficult for me. This building has simple, clean lines. The architecture is not fighting with the art work. In the center of the building is a restful area with benches, open to the sky. Both the exhibit and the building have a serene atmosphere. Sometimes life is simply too funny in how it all comes together in one perfect moment. Yesterday was the opening of Prandi Capalini’s photography exhibit at The Small Gallery in Shengri La. I know am boring but I was working at landscaping and building. I didn’t really feel like I had time to take off to play. But I have learned that play (and SLEEP) are actually VERY necessary if I am to keep functioning. Or semi-functioning. So I headed off to the opening party. Several good friends were there as well. We were chatting and discussing the photos (which were great, by the way). Suddenly I saw my name in chat. Dale was saying “I believe that is Ahuva’s bus.” My bus???? I strolled down the gallery to look. OH MY GOODNESS!!!!! MY BUS!!! IT WAS MY BUS!!!!! The bus under which I originally threw myself a year ago. The bus that changed my life. *grin* The bus under which I am currently pinned around the clock. LOL. Yes, I love it. Well, despite Adricantfarm’s comments on Dale’s blog, I do not find that bus scary at all anymore. (Okay, maybe a little at times.) The general consensus was that Night Bus had to come home with me. *grin* And it did. Prandi has many lovely pictures that are NOT buses set to run you down. 🙂 I think my favorite was Druzy, a wonderful soft and touching portrait. Had I not seen “Night Bus”, “Run for the Roses” would be hanging on my wall now. But I am severely limited these days by lack of wall space and lack of prims!!!! Be sure to head on down to the gallery. Prandi was delightful (LOL – we were all burying him under a flood of IMs) and the photos are very enjoyable and intriguing. And check out “Night Bus” – although my view always seems to be from underneath, Prandi got a much better angle on it! Oura had her first rez day this week! We celebrated by hitting as many events as we could in a limited period of time. 🙂 We both love live music and dancing so you KNOW there was going to be a lot of that! We started the evening at the Art Box. Dale blogged about this recently. It is a wonderful build and a lot of fun! Oura had been there earlier in the day and enjoyed it so much she insisted we go back so that I could try it. 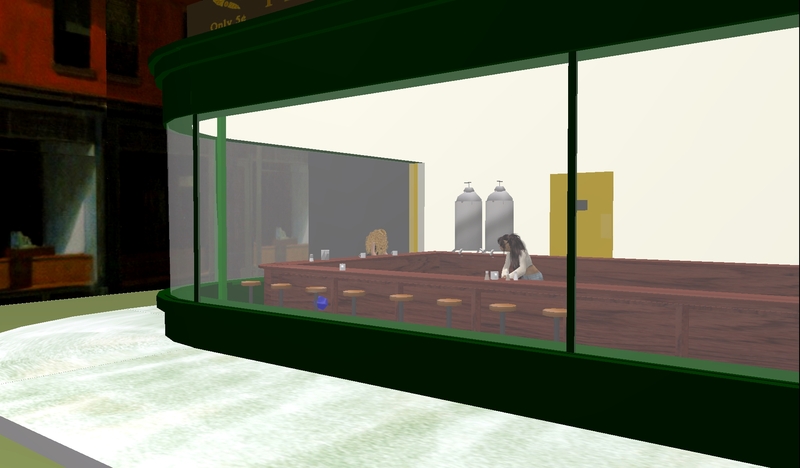 We picked Edward Hopper’s Nighthawks. One of the many nice features of Art Box is the background/description they supply for the pictures. A Sonnet of Love / Rob Hefferan. Rob Hefferan is an extraordinarily talented figurative artist & portrait painter, born in 1968 in Warrington, Cheshire, England. 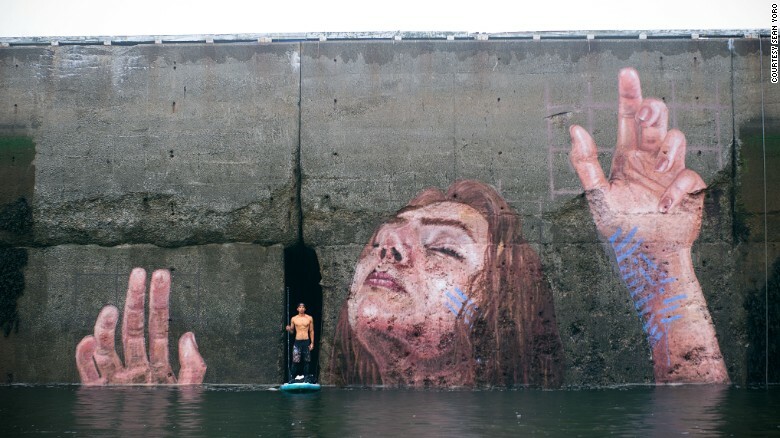 For Hefferan, realism is about bringing an awareness of the everyday in a very beautiful and optimistic way. Specialising in the female form, he says “”I aim to capture the character and soul of the sitter and to freeze that moment forever”. From there we jumped to the Gallery of Light at the Crown and Pearl. Bailey Dazy is displaying her photography there this month and the opening for the show was that night. Besides being a fun person, gorgeous Neko and great dancer, Bailey is a resident of Angel Square and a DJ at the Crown and Pearl. About herself she said: “Second Life photography is a passion; it’s something I truly enjoy. When the mood strikes, I shoot… and I often enjoy what I see.” You can see Bailey’s photos at the CnP or on her Flickr site. Much as we wanted to stay and keep partying at the CnP to the tunes Bailey Longcloth was playing, time was working against us if we wanted to hit the live performances. So it was off to Noma Falta rocking SL from Wiseguys. I love some of the dance balls I encounter. I don’t know about you, but I have NEVER done backflips or splits while I am dancing in RL. In SL, however, I can bend like Gumby. Better. 🙂 So Oura caught these pics of us dancing on our heads. It helps when there is no law of gravity. By the way – if you notice the improved photo quality, that is because Oura took all these pictures. *grin* The difference is immediately apparent. Yay Oura! While we were at Toby’s I found out that my friend Bob was DJ’ing at Ruby’s, rocking with the blues. Okay, I love the blues. I wanted to hear Bob DJ’ing. So although it hurt, we left Noma early and went to Ruby’s. I don’t think I’ve ever been there before. I like the dance floor and the synchronized dance balls. Faust had caught up to us at that point and he was partying alongside us. *grin* I think I’ve mentioned my good friend Faust before. Check out his cool hat. We were having a great time at Ruby’s, dancing up a storm. 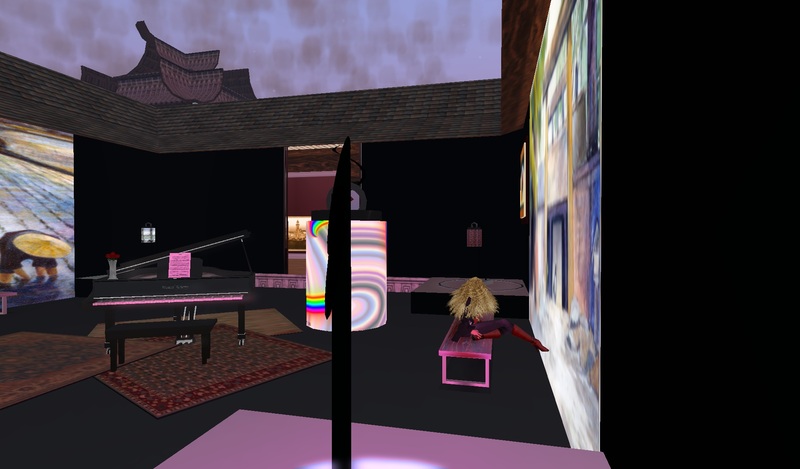 But we were racing against the clock still and needed to make Von Johin’s concert at Ruby’s. 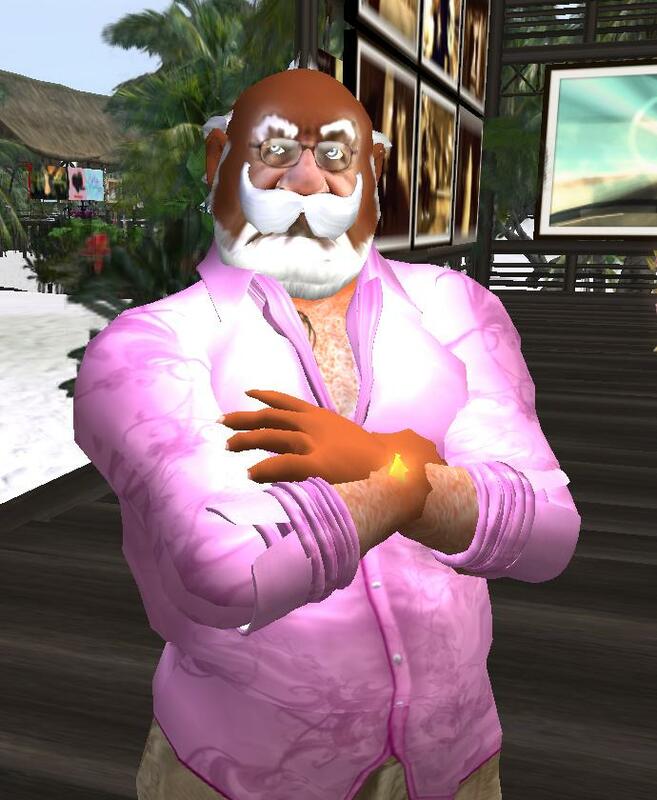 *grin* Never a dull moment in SL. Von was great as ever. Faust saw someone wearing a green dragon on his shoulder and fell in love with the dragon. Faust IM’d the gentleman, who told Faust that the dragon was found in a hunt. I mentioned this to Oura. LOL. Oura not only KNOWS everything, she probably HAS everything in her inventory. In this case, she did NOT have the dragon, but she did know which hunt and which store. I am happy to say that Faust was able to track down the proper hunt and find the prize and now sports a dragon on HIS shoulder. *grin* It takes so little to make some of us happy. My dear friend Nat often has a bunny on HER shoulder and it always makes me smile. The evening was getting long at this point. Von’s sim was full and Jonah couldn’t tp in to join us. I decided that perhaps it was time for me to call it quits – I’d already done quite a bit of adventuring on the road earlier in the day. So we timed it well and I tp’d out and Jonah was able to tp in and join Oura and Faust. I headed home to get tucked into bed and sleep, in preparation for a new day of partying! Happy Rez Day, Oura! I hope you had as much fun as I did! I’m so glad we’re friends! Ahuva ❤ Oura.